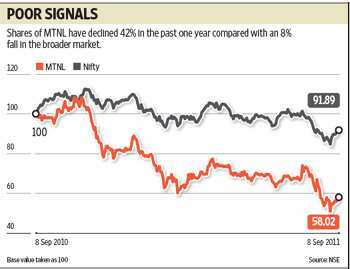 Shares of Mahanagar Telephone Nigam Ltd (MTNL) have risen by around 15% from the record low they had hit in end-August. But that’s hardly any reason to cheer. In the past one year, the stock has declined 42% to Rs37.80, which isn’t surprising considering the fact that the company has reported pre-tax losses of around Rs3,000 crore for two consecutive years. The company’s high level of indebtedness is further weakening its financial performance. In the quarter ended June, MTNL reported a pre-tax loss of Rs850 crore, compared with a loss of Rs450 crore in the year-ago June quarter. Interest costs rose to Rs186 crore last quarter from Rs27.7 crore in the year-ago period. Of course, the high interest burden isn’t its only problem. The main challenge for MTNL is its high employee cost, which equalled its total revenue last quarter. The firm has approached the government to approve a voluntary retirement scheme for about one-third of its workforce to deal with its high cost structure. According to a recent report by HSBC Research, if the company is successful with its early retirement programme, around Rs30 per share (or Rs1,900 crore) would be added to MTNL’s valuations. But it needs to be noted here that the company hasn’t been successful with its previous such schemes, and undue optimism on this front would be misplaced. In this gloomy backdrop, can investors expect any upside? Analysts at HSBC note that given MTNL’s poor spectrum utilization on the GSM network, it will be better off monetizing the spectrum it acquired during the 3G and BWA auction process. It could earn lease rentals on this spectrum rather than just focusing on the roll-out of these services by itself, and according to HSBC, this could add Rs22 to MTNL’s equity valuation on a per share basis. Of course, it remains to be seen if the company is able to strike such deals with private operators. Meanwhile, given the lack of meaningful catalysts, it seems best to avoid the stock.